Photometric measurements could yield valuable information about an extrasolar terrestrial planet, and may be the only practical characterization technique for faint planets near the detection limit of a particular mission. However, for brighter planets, by far the most powerful technique available for retrieving the characteristics of planetary surfaces and atmospheres is spectroscopy, which samples radiation reflected, scattered or emitted by the planet at different wavelengths. Ultraviolet, visible and near-infrared radiation from the parent star interacts with the planetary surface and atmosphere as it is scattered and reflected from the planet. Similarly, at typical planetary temperatures, significant thermal infrared (typically wavelengths between 5-50^m) is emitted by the planet and interacts with the planetary atmosphere as it escapes to space. These interactions produce characteristic absorption and emission bands (Fig-10.2 that can reveal the composition and physical properties of the atmosphere and surface (c.f. Hanel et al., 2003). In some cases, the wavelengths at which spectral features are observed can be used to straightforwardly reveal the presence of different types of molecules in the atmosphere via comparison with the known spectral features for gases taken from a spectral line list (Rothman et al., 2005, http://vpl.ipac.caltech.edu/spectra/frontpage.htm). However, most planetary atmospheres contain more than just one or two gases, and if the spectral resolution of the instrument is also low, then the presence of a particular trace gas species may have to be disentangled from overlapping spectral features from another species. This may require either higher performance instrumentation, or the use of an atmospheric radiative transfer model to simulate the observed spectrum for a multi-gas atmosphere. Additionally, with sufficient instrumental precision, the temperature and pressure environment of the molecule can be gleaned from the shape and width of the spectral band. This shape can be affected by thermal Doppler broadening of the constituent molecular lines (an effect that dominates at lower pressures, typically higher in an atmosphere), pressure-induced Lorentz broadening (a function of the frequency of collisions, and so dominant at the higher pressures closer to the planetary surface), and the temperature distribution with altitude in the planet's atmosphere. Clues to the atmospheric temperature distribution are most readily obtained in the MIR, where band shape, i.e. whether a feature is in absorption, emission, or a combination of the two, is a function of the temperature structure and constituent distribution along the line of sight. Fig. 10.2. Solar System spectra. Synthetic disk-averaged spectra of Venus, Earth and Mars showing an array of spectral shapes and both atmospheric and surface absorption features. Spectra from the VPL, graphics by Tim Pyle, Spitzer Science Center. radiation to create an emission feature in the center of the band, and reduce the depth of the observed absorption feature. Consequently, to disentangle the two effects of temperature structure and the vertical distribution of a gas in a planetary atmosphere, temperature structure determinations from line shapes are best done with a gas that is likely to be evenly mixed in the atmosphere, such as CO2, and not with a vertically inhomogeneously mixed gas such as ozone, water, or methane. The mid-IR and the optical/near-IR spectral regions provide strongly complementary information on planetary characteristics. Observations in both spectral regions can help to reduce confusion due to overlapping spectral features from different planetary constituents, and provide more robust observations of a single constituent by observing multiple spectral bands. It is highly desirable to remotely explore extrasolar planets over as broad a wavelength range as possible. Once disk-averaged spectra are obtained for an extrasolar terrestrial planet by missions such as TPF and Darwin, we will initially search those spectra for the signs of a planetary atmosphere, including the bulk (principal) and trace (smaller component) gases. The detection of these gases may indicate several environmental characteristics for habitability, the presence of an atmosphere, abundant liquid water, a shield against surface UV radiation, and the presence and amount of greenhouse gases. Earth's main atmospheric gas, nitrogen (N2), has no strong spectral signatures at wavelengths other than the far UV, although its presence might be inferred from its scattering properties in the UV to the visible, or its pressure broadening effect on the spectral features of other atmospheric gases. Oxygen (O2), which constitutes 21% of the Earth's atmosphere is more readily detectable in the spectrum, with a triplet of features in the 0.6-0.76pm region. However, in our Solar System, it is only present in large quantities on the Earth, and so is not a good universal indicator of the presence of an atmosphere. 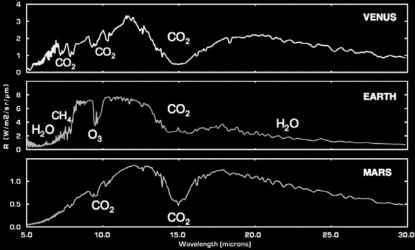 In contrast, carbon dioxide, which is a trace gas in the Earth's atmosphere and a bulk gas on Venus and Mars, produces strong spectral features in the MIR in all three cases (Fig. 10.3). For Venus, and for Earth-like planets with at least 0.2 bars of CO2, it also produces strong features in the near-IR between 1.0 and 1.7pm (DesMarais et al., 2002; Segura et al., 2007). This gas is likely to be rare in strongly reducing atmospheres such as those seen on the giant planets. Consequently CO2 is currently considered to be the most detectable indicator of a terrestrial planet atmosphere. Fig. 10.3. Solar System spectra. Synthetic disk-averaged spectra of Venus, Earth and Mars in the MIR. CO2 at 15^m can be seen prominently in all three planetary spectra. Spectra from the VPL, graphics by Tim Pyle, Spitzer Science Center. as ozone, or an aerosol. The presence of a UV shield could be inferred from either a direct detection of the shield material itself, such as the abundant ozone observed at 9.6yU,m in the Earth's spectrum, or an indirect measurement via the temperature profile inferred from the band shape of an unrelated, but evenly-mixed gas. In the case of the Earth, carbon dioxide is evenly mixed throughout the atmosphere, and can be used to infer the atmospheric temperature structure. In particular, the carbon dioxide feature at 15^m exhibits a central emission peak that indicates a hot stratosphere. The stratosphere is hot in this case due to strong absorption of incoming solar UV radiation by ozone. Consequently, the shape of the CO2 band serves as a secondary indicator of a UV shield, and could be used to corroborate an otherwise marginal detection of ozone in an extrasolar planetary atmosphere. Finally, the spectrum of an extrasolar planet atmosphere may reveal the presence of other gases, including those that can enhance a planetary greenhouse effect. The nature, and ideally the abundance, of these gases should be determined to provide the best possible estimate of the planet's surface temperature. 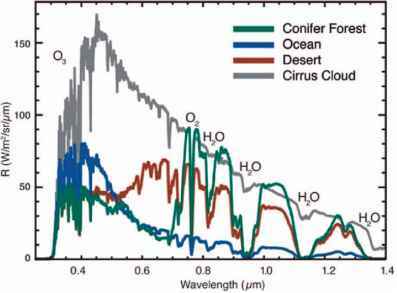 Typical terrestrial planet gases, such as O3, N2O, NO2, NO, CO, CH4, O2, SO2 and OCS etc., can produce distinctive spectral signatures at UV, visible, and/or infrared wavelengths, which could potentially be directly detected. Quantification of these gases however, is more problematic. In the visible, an estimate of the atmospheric mass would be required for accurate abundance retrieval, and in the MIR, knowledge of the atmospheric temperature structure would also be required. Modeling the effects of broadening seen in infrared bands of absorbing gases can be used to infer the atmospheric pressure at the emitting level in an atmosphere. For relatively transparent atmospheres (e.g. Mars, Earth) radiation from the surface or near-surface atmosphere escapes upward through the atmosphere, allowing the total or near-total mass of the atmosphere to be derived from the planet's spectrum. For opaque atmospheres, (e.g. Venus or the Jovian planets), only the atmospheric mass above a cloud deck or other opaque surface can be determined, because that is the limiting depth from which we can see atmospheric radiation escape. Observations at different wavelengths probe different levels of an atmosphere, and can indicate different effective pressures, thereby providing additional constraints on the vertical variation of pressure in an atmosphere. This information is important both for studies of the planet's climate (which can be used to infer surface temperature) and for quantifying the trace gas mixing ratios for studies of the atmospheric chemistry. The 'holy grail' of habitability is the ability to determine if a planet has a surface pressure and temperature that is conducive to the existence of water in its liquid phase. Thermal infrared or microwave spectra may return atmospheric, and possibly surface temperatures, but this will depend on whether the wavelength chosen to make the temperature measurement is relatively free of atmospheric absorption, and capable of sensing radiation from the planetary surface. For an Earth-like terrestrial planet whose atmospheric absorption is dominated by H2O, CO2, and O3 (e.g. Earth, Mars), surface temperature data is best sought in the spectral window at wavelengths between 8 and 12^m. At these wavelengths, the ubiquitous water vapor continuum absorption and strong, narrow O3 band near 9.6^m are the only significant sources of atmospheric absorption. At shorter and longer thermal wavelengths, strong absorption by H2O and CO2 largely preclude surface observations. However water vapor does still produce weak continuum absorption throughout the 8-12yU,m window regions, and in high water vapor atmospheres (as seen in the Earth's tropics) can return a cooler brightness temperature for the atmosphere a kilometer or so above the surface, rather than the surface temperature itself. In addition, planets with atmospheres of different composition may produce an atmospheric window over a different wavelength range, as is seen in the case of an atmosphere that contains 2-bars of CO2, where the atmospheric window is an extremely narrow region between 8.5 and 9.0^m (Segura et al., 2007). In this case, absorption from the far wings of CO2 also preclude detection of the surface temperature within the atmospheric window. The accuracy of the surface temperatures derived from these measurements also relies on correctly estimating the planet's emissivity, which is in turn a function of the planet's surface composition, and could be anything from ice to molten rock. If the surface emissivity is not known, then it is very difficult to retrieve an accurate surface temperature. Because infrared spectral features depend both on the amount of constituent in the atmosphere and the temperature structure, atmospheric temperatures are required to quantify trace gas amounts from thermal radiances. For example, on Earth, accurate estimates of the atmospheric temperature distribution are essential for quantifying the atmospheric concentrations of gases such as water vapour and ozone. Global scale constraints on the atmospheric thermal structure are also valuable for studies of the planet's climate and chemical equilibrium, and to determine whether or not liquid water is stable on the surface. The atmospheric temperature structure can be retrieved from the spectrum of a well-mixed gas with well-characterized absorption features that is free of absorption from other atmospheric gases or particulates. For the terrestrial planets with atmospheres in our Solar System (Venus, Earth, and Mars), observations of the CO2 15^m band provide the best available constraints on the atmospheric thermal structure. For planets with H2 dominated atmospheres (Jupiter, Saturn, Uranus, Neptune), the atmospheric temperature structure can be retrieved from the hydrogen continuum absorption at wavelengths longer than 20^m. One advantage the optical wavelength regime has over the mid-IR is that although the mid-IR region is sensitive to both surface and atmospheric temperatures and trace gas abundances, it is generally insensitive to underlying surface composition. This is due in part to the relatively small "atmospheric windows" to the surface in the MIR range, from 8-12^m for the Earth, and even smaller in a wa ter vapor- or CÜ2-rich atmosphere. This problem is compounded by the typical lack of spectral features, and the uniformly high emissivity of most Earth surface types (ocean/land/vegetation) at these wavelengths. Exceptions exist, however, and quartz sand displays low emissivity between 8-9^m, revealing its presence in MIR spectra taken over the Sahara (Hanel et al., 2003). Another exception is carbon dioxide ice, which has an abrupt change in emissivity across the 10-12^m wavelength range, and might be identified in a disk-average spectrum at mid-infrared wavelengths if present on a planet with a relatively thin atmosphere, as is the case for Mars (Tinetti et al., 2005). The optical and near-infrared spectral regions contain a rich array of features associated with surface composition, and optical observations may be able to distinguish between a world dominated by oceans, sand, rock, ice, or clouds. In addition to searching for habitable environments, searching for ice is also important. An ice covered planet may be a clear indication that the planet is not habitable, and if the composition of the ice can be determined, provides a further constraint on the surface temperature. Fig. 10.4. Surface Spectra. This diagram shows simulated spectra of radiance along lines of sight through the Earth's atmosphere over surfaces of different types (vegetation, ocean, desert and clouds). In all cases, the incoming spectrum of sunlight was the same, but the radiation reflected back to the observer is quite diverse. This behavior allows us to understand surface composition in remotely-sensed data. As with time-variable photometry, understanding how different spectral features change with time may help us infer spatial information in disk-averaged observations (e.g the presence of continents or oceans), and may also reveal variations in surface and atmospheric composition that are linked to day-night or seasonal variations e.g seasonal ice caps or dust storms (Tinetti et al., 2005). Variations in the retrieved atmospheric temperature or pressure variations could also yield information about global scale weather systems, or seasonal variations in the total atmospheric mass, like those that characterize the Martian atmosphere. Information on the surface type, temperature variations and climate over the course of an orbit are all important for understanding the potential habitability of a planet. 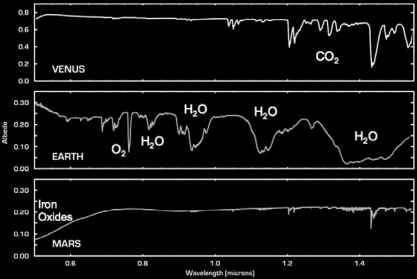 What spectroscopic signature from an extrasolar planet might indicate life? How can the surface composition of planets be used in remote sensing?